Wherever I take it, this machine always attracts stares. It certainly has an outlandish appearance. I’ve always liked le Poulain cyclemotors. The company was a well-respected upmarket manufacturer. The first le Poulain of 1949 was this front-mounted design. 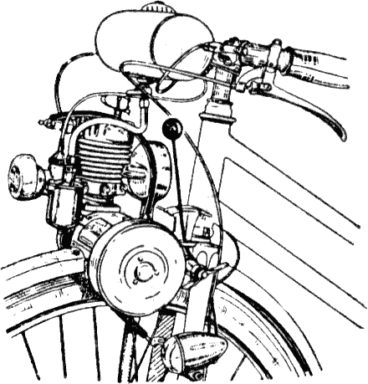 Later they developed engines to fit in the conventional moped position: on page 112, you can see my new-old-stock 1952 Select 52 moped, which uses the later le Poulain engine. The company started producing their range of ‘moteurs auxiliaires’ in 1949, and the Model A was the first model. Unlike some of the other engines fixed over the front wheel, le Poulain is a well-balanced machine. The only design faults I’ve found in these units is that the original gear levers used to rock the roller-wheel down onto the front tyre have nearly always disintegrated over the half a century they’ve been in existence. You’ll observe a re-manufactured set-up on this one, on the left side of the engine (above). This Model A was restored in 2007, and the attractive bicycle matches the engine’s interesting ‘fifties futuristic’ style. I’ve never tried to start it. It will probably need a bit of fiddling to get it running. The follow-up models were introduced after only one year, so the Model A is now particularly scarce. Same female rider but different engine. Above is the Model A; below you can see the Standard and Luxe models of 1950. Compare the ‘Standard’ model in the advert above with the ‘Luxe’ in the advert below.